The hybrid grape variety Marechal Foch. Hybrid grapes are grape varieties that are the product of a crossing of two or more Vitis species. This is in contrast to crossings between grape varieties of the same species, typically Vitis vinifera, the European grapevine. Hybrid grapes are also referred to as inter-specific crossings or "Modern Varieties." Due to their often excellent tolerance to powdery mildew, other fungal diseases, nematodes, and phylloxera, hybrid varieties have, to some extent, become a renewed focus for European breeding programs. The recently developed varieties, Rondo, and Regent are examples of newer hybrid grape varieties for European viticulturalists. Several North American breeding programs, such as those at Cornell and the University of Minnesota, focus exclusively on hybrid grapes, with active and successful programs, having created hundreds if not thousands of new varieties. Hybrid varieties exhibit a mix of traits from their European, Asiatic, and North American parentage. Those varieties which derive from Vitis labrusca parentage (such as those still used in the production of Austrian Uhudler) have a strong "candied" or "wild strawberry" aroma, while those that derive from Vitis riparia often have a herbaceous nose with flavours reminiscent of black currants. Most hybrid grape varieties struggle to produce adequate tannin for red wine production, and usually display a level of acidity that exceeds what consumers of wines produced from vitis vinifera are accustomed to. These attributes proved unpopular in Europe, and were among the factors that led to the prohibition of the commercial growth of hybrid vines in many countries in Europe. The hybrid grape Merzling created by a crossing Seyve-Villard 5276 with a cross Riesling × Pinot gris. During the first half of the 20th century, various breeding programs were developed in an attempt to deal with the consequences of the Phylloxera louse, which was responsible for the destruction of European vineyards from 1863 onwards. After extensive attempts, grafting European varieties onto North American rootstock proved to be the most successful method of dealing with the problem. Example of a breeder castrating all flowers of a grapevine cluster. However, hybrid grape varieties were introduced as a solution to many of the viticultural problems of shorter-season, cooler and more humid wine regions, such as those in the northeast and Pacific Northwest of North America. From the 1950s onwards, grape varieties such as De Chaunac, Baco noir, Marechal Foch, Vidal, etc. have been a staple of the wine industries in Ontario, New York, Pennsylvania, etc. Only since the 1970s and 1980s have vinifera varieties begun to displace hybrid grapes in this area. Even in those areas where vitis vinifera now predominates, hybrid varieties still have "cult following" with some wine consumers. 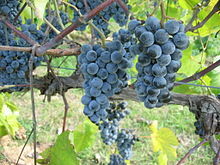 Furthermore, in some cases hybrid grapes are used to produce unique and exceptional products; for example, ice wine produced from Vidal blanc or Vignoles in Ontario and New York. Hybrid grapes are expanding in traditional vinifera wine regions, because they can be easier to grow and can ripen earlier than vinifera (which reduces bird predation and reduces the risk of fruit hanging into the Fall rains), and because they typically have much more disease resistance (thereby requiring less spraying, which lessens tractor fuel usage and the volume of spray applications). Therefore, hybrid grapes are considered a "Green" alternative to vinifera grapes. The Vitis aestivalis hybrid grape Norton. Vitis vinifera, the so-called European or wine grape, indigenous in the Eurasian area. Classed within this species are the best-known table and wine grape varieties such as Riesling, Chardonnay, Cabernet Sauvignon, Pinot noir, Merlot and Gamay. Vitis aestivalis, native to eastern North America. Vitis rupestris, native to North America. Vitis riparia (also sometimes known as Vitis vulpina), the "river bank grape", native to northeastern North America. Vitis amurensis, the Asiatic grape species, native to Siberia and China. Vitis labrusca, native to northeastern North America. Concord and Niagara are both interspecific hybrids with a large labrusca content. While rare, interspecific hybrid vines can result in the wild from cross-pollination. Due to the abundance of American Vitis species one finds such natural hybrid vines on the American continent. The majority of the well-known hybrid vines however, have been artificially created. The earliest named hybrid in America was the Alexander grape, discovered around 1740 near a vineyard planted for William Penn along the Schuylkill. The Regent grape produced by a crossing of Diana and Chambourcin. T.V. Munson: often cited as the savior  of European viticulture and the father of rootstock breeding, released dozens of cultivars and contributed greatly to the knowledge of wild American grape species. Albert Seibel: Probably the best-known breeder, who developed an immense number of breeding between 1886 and 1936 in Aubenas. The well-known Seibel grapes include De Chaunac, Chelois, Chancellor, Cascade, Rosette, Rougeon and Aurore. Elmer Swenson, of Wisconsin, breeder of St. Croix, St. Pepin, La Crosse, Esprit, Edelweiss, Swenson Red, and Kay Gray among others. Frontenac, Marquette and La Crescent, developed at the University of Minnesota. ^ Archie P. MacDonald. "All Things Historical". Dr. Thomas Volney Munson and the French Wine Industry. This page was last edited on 12 August 2017, at 00:38 (UTC).